We have a lead paint case in California that is still going on. While browsing through some other news on lead paint, a housing agency just paid 6.8 million dollars to lead paint victims. Lead based paint has been banned since 1978 in the United States and in Baltimore many of the housing were built before the ban. 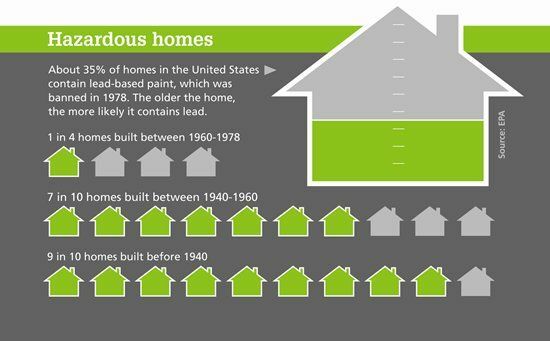 In addition, The Centers for Disease Control and Prevention say 24 million housing units still have a lead paint. The dangers of lead paint are severe. For instance, if a child eats small amounts of lead it can cause permanent brain damage. In most cases, anything that triggers the lead paint to become fine fibers and float in the air can go inside your body. Sanding and scraping can increase the levels of lead in a home or building. These are incidents that happen in a home when individuals renovate their home or scrape off paint of the walls. Previously blogged, EPA is considering regulating lead based paint in commercial buildings both in the interior and exterior. Interior renovations in buildings can generate lead contaminated dust. Exterior work could generate amounts of lead contaminated dust that can affect the soil and cause exposure outdoors that then generates poor outdoor air quality. At Alliance Environmental Group, Inc our environmental division follows strict procedures to minimize, control and contain the lead dust created by the removal process. Alliance is a certified lead-removal contractor. If you are concerned about lead paint in your home or commercial building we can assist you. Visit our website and like our Facebook Community Page to keep updated on the services that Alliance provides.